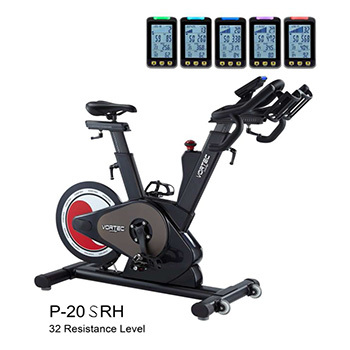 Exercise Bike / Indoor Cycle, P-20SRH - Kenny-Joyce Co., Ltd.
A beautiful design with innovation magnetic resistance device , providing a quiet and smooth ride. Quick-release system, Alloy construction on handlebar-stem /seat post. offers manimum stablity and durability. Easy ride Easy use. 5 different lights colour to present different exercise intensity(watts). Consol with 7 functions and WATTS measurement. Console : 32 resistance control lever. Adjustable-seat height and extender., High performance seat position adjustment devices with scale. Direct drive system with Hutchinson BELT. High anti-rust protection and low maintenance. one alloy bottle cage type or two steel bottle cage type. 5/8" pedals axle or 9/16" pedals axle. WPD dual sided pedals (seal bearing or ball bearing ) or normal pedals. Black hard anodized or silver anodized on handlebar stem/seat post/slider.